Nearly as fast as the 7980XE, slightly more affordable, but still not for gamers. The i9-7960X is extremely potent, but the price and power are tough pills to swallow. 2017 is officially the year of the CPU—I can't recall a year where new product launches were so frequent. And these aren't meaningless 100MHz bumps in performance either, as both AMD and Intel have been on a roll. To recap, we've had the initial Kaby Lake desktop launch, with the i7-7700K, i5-7600K, and i3-7350K (plus other non-K chips). Then AMD had a staggered rollout of its Ryzen line, with the Ryzen 7, Ryzen 5, Ryzen 3, and finally Ryzen Threadripper parts. In between Ryzen 3 and Ryzen 5, Intel also came out with initial Skylake-X and Kaby Lake-X processors, and we specifically looked at the Core i9-7900X (and later, at least in the Threadripper charts, the i7-7820X). Today we have the second set of Skylake-X parts with the Core i9-7920X through i9-7980XE, and we're not done yet, as Coffee Lake and the i7-8700K will arrive on October 5. Whew! But what's crazy with all of these CPU launches is that, at least as far as PC gaming hobbyists are concerned, many older CPUs remain perfectly acceptable solutions. If you have a Core i7 from any time in the past several years, you'll want to think twice before upgrading—at least, unless you want to do things besides playing games. Even AMD's aging FX-series processors continue to work well enough for most games, particularly if you're not using a top-end graphics card and hoping for 100+ fps framerates. But with bragging rights on the line, Intel reclaims the top two spots in consumer CPU rankings with the i9-7980XE and the i9-7960X. The Core i9-7960X is in many ways the more sensible alternative to the i9-7980XE—you can read the full review of the 7980XE for additional details. Not to put too fine a point on it, but beyond the Core i9-7900X, it becomes very hard to justify buying any of Intel's Core i9 products, especially when it comes to gaming. The overall difference in performance between the i7-7700K, which currently sells for as little as $300, and the $1979 i9-7980XE is negligible. If you're reading this on PC Gamer because you mostly care about games, know that for at least the next 10 years, I can't see any gamer actually needing a 16-core/32-thread processor. Buying a faster graphics card will almost always be the better investment. But what about for non-gaming purposes? If you play games on the side but also dabble in video editing, 3D rendering, software development, or other professional pursuits, the move from 4-core to 8-core to 16-core becomes more meaningful. And with two fewer active cores compared to the 7980XE, the 7960X is able to reach higher all-core clockspeeds, making the practical difference between the two processors very small. You still need a very good reason to go beyond the base level i7-7800X, or a Ryzen 7 1800X, at least from a CPU performance standpoint. Sure, the additional cores can help speed up video encoding times, and the 7960X has four complete (more or less) i7-7700 chips inside it, but unless you're consistently waiting on your CPU to catch up, you're better off putting your money elsewhere. 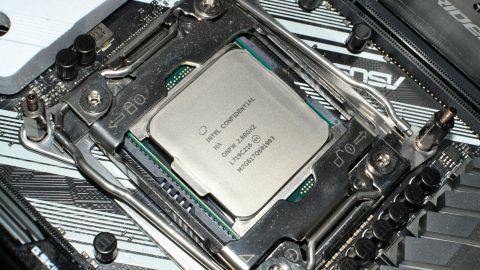 Above are the official CPU specifications and Turbo Boost frequencies for Intel's X299 CPUs. This includes with Turbo Boost Max 3.0 clocks for 1/2 core workloads, which require BIOS support and are sometimes a bit iffy in my experience (as in, they don't always seem to work). Overall, the 7960X drops two cores but includes slightly higher clockspeeds compared to the 7980XE, leading to very similar performance in most cases. Paying an extra $300 for the final three percent in performance is a tough upsell. As I mentioned in the i9-7980XE review, power use from the Core i9 parts is also quite high, sometimes alarmingly so depending on your motherboard of choice. While there are many elements to total system power draw, I only have equipment to measure total load (including power supply inefficiency). Running 'stock' (according to the motherboard BIOS, which basically uses the above Turbo Boost values), the 7960X uses 369W in Cinebench—and more in other workloads, particularly those that use AVX instructions. Likely due to binning, or perhaps motherboard firmware, that means the 16-core part is actually using more power than the 18-core part. That extends to overclocking as well, where the 7960X peaked at 587W versus 576W on the 7980XE. For a motherboard like the Asus Prime X299-A where it includes a 4-pin ATX12V connector along with an 8-pin EPS12V connector, that's a lot of juice flowing through the VRMs, and I wouldn't recommend going that route without substantial cooling—probably more than the Corsair H115i I used in testing (with fan speed at 80 percent). Below are all the CPU and gaming benchmarks, provided with little commentary. You can flick through the galleries to see all the individual tests, but the aggregate score on each chart provides a good summary of performance. Stock or overclocked, the gap between the i9-7960X and the i9-7980XE is very small. Best-case, I measured up to a 10 percent performance advantage for the 7980XE (when both chips are overclocked and drawing around 500W), but on average the difference in performance is only three percent. In terms of value, that makes the 7960X the better value, but I'm not sure talking about 'value' makes much sense at this level. It's like the Titan Xp versus the GTX 1080 Ti—the Titan is maybe 3-5 percent faster and costs 70 percent more, but people still buy it. If you're wondering how AMD's 16-core Threadripper 1950X stacks up against Intel's 16-core part, Intel wins most of the benchmarks. Threadripper ties it in VeraCrypt, with a small lead in 7-zip decompression speed, but overall the 7960X ends up around 13 percent faster. It's not a clear-cut victory, however, as in a swap from previous CPU battles, the 7960X also draws 40 percent more power in Cinebench. And of course, Intel's 7960X costs $700 more than 1950X. Intel is clearly chasing performance without regard for efficiency with Skylake-X, something I'm not really keen on seeing. The clockspeed wars of the 90s and 00s ended up slamming into a power wall with Pentium 4 and the NetBurst architecture. Now we're seeing core count wars instead, and the result will end up hitting a similar power wall. The 7960X and 7980XE already show that, with higher core counts being largely negated by lower clockspeeds. Gaming performance is the same story I've been telling since the i9-7900X: you really don't need this much CPU performance to play games. Even with the fastest graphics card in the form of the GTX 1080 Ti FE (not counting the Titan Xp), running at 1080p ultra settings in order to emphasize differences in CPU performance, there's almost no difference between the various Core i7 and i9 processors. Even minimum framerates don't clearly favor Intel's X299 chips over the i7-7700K, with some games benefitting and others performing worse. If the gaming tests were done at 1440p, which is a more common resolution for high-end gaming PCs, the margins become even narrower as the GPU takes over as the primary bottleneck. Using a slower graphics card would likewise reduce the difference, to the point where a GTX 1070 or lower would show almost no benefit from the faster GPUs, except in a few specific cases (eg, Ashes of the Singularity). Compared to the 7980XE, I was able to get 16-cores running at 4.2GHz, slightly higher than the 4.1GHz on 18-cores. Power draw as mentioned above ended up being slightly higher on this chip, however, and with the system pulling nearly 600W from the wall, the CPU is probably accounting for at least 400W. Without better cooling, including on the motherboard VRMs, this isn't the sort of overclock I'd feel comfortable running, even though I was able to keep CPU temperatures under 90C (which is still higher than I like). The combination of price, cooling, and power requirements make Skylake-X a far more difficult platform to recommend compared to the previous generation Haswell-E and Broadwell-E. Skylake-X chips are almost always faster, fully stock or overclocked, but Broadwell-E is more power efficient. If you already own a 6-core, 8-core, or 10-core HSW-E or BDW-E processor, there's no need to upgrade just yet, particularly for gaming purposes, but the very people that bought those processors are often more likely to buy the next big thing. I'd generally say that if you're willing to look at the i9-7960X, you should just throw all caution to the wind and dive headfirst into the i9-7980XE. Because bragging rights. That might still be the way to go if you're hoping to set some overclocking world records with LN2, but for less dramatic endeavors, the i9-7960X is close enough that you generally won't be able to tell between it and the fully armed and operational 7980XE. But let's be real: most people shouldn't be looking at either of these CPUs, and for gaming purposes everything beyond the i7-7700K (or i7-7740X) is pretty marginal. I do wonder how long it will be before 16-core processors go 'mainstream.' The first quad-core $1000 CPUs like the Core 2 QX6700 were eclipsed by the Core i7-920 after only a few years, and by 2010 quad-core processors were pretty common. 8-core chips have been around in various forms since the FX-8150, but those eight cores were slower than Intel's four cores and don't really count. Meanwhile, Intel has offered 'consumer' 6-core CPUs since 2010 and 8-core parts since the i7-5960X in 2014, but neither category has become anything close to typical. With Coffee Lake finally bringing 6-core to Intel's mainstream platform, that hurdle may finally fall, but it could a decade or more before 16-core solutions are remotely common. This 16-core i9-7960X earns a few extra points over its big brother 7980XE for not being quite as loud and obnoxious, but loses points for similarly high power draw and the lack of prestige that comes from the 'almost had it all' second fastest CPU status. We end up with a net tie. Either way, you can rip through high quality 1080p60 video encoding in real-time. Or go for 4K encoding and take your lunch break.